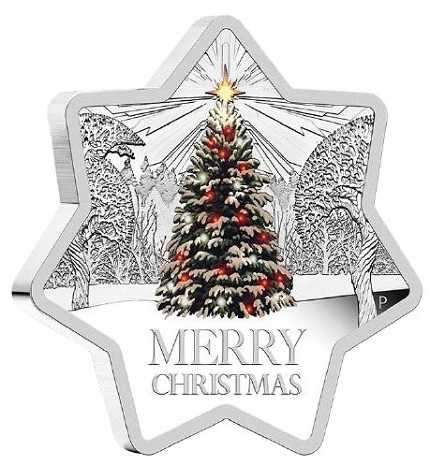 It may only be the first week of October, but the Perth Mint has released its Christmas 2015 1 oz. 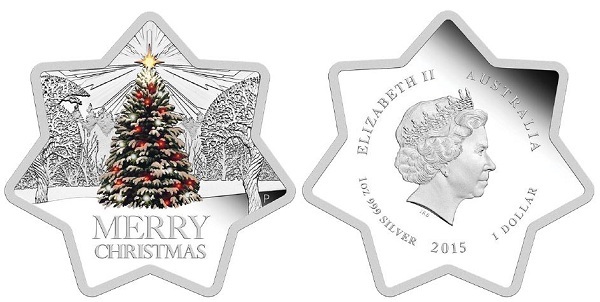 Silver Star Shaped Coin in preparation for the holidays. It is composed of silver that is 99.9% pure, with a mintage limited to 5,000 pieces, and a price tag of $109.00 per coin. The coin’s reverse bears a color image of a Christmas tree covered in snow, adorned with red lights, and topped by a gold star. Surrounding this centerpiece is a wintry forest rendered in silver. 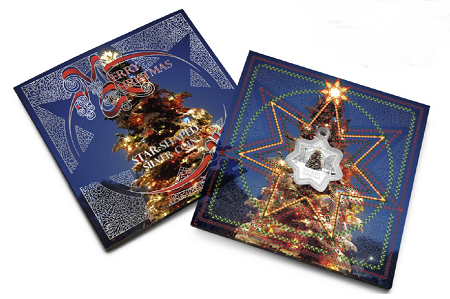 At the bottom of the star-shaped design are the words MERRY CHRISTMAS. The obverse includes Ian Rank-Broadley’s portrait of Queen Elizabeth II, along with the inscriptions ELIZABETH II, AUSTRALIA, 1 oz 999 SILVER, 2015, and the coin’s monetary denomination of 1 DOLLAR. The coin’s protective case features a hole at its top, allowing the coin to be turned into a Christmas tree ornament when tied with ribbon. The outer packaging resembles a gift card, further recommending the coin as a Christmas gift for interested collectors. This is the first star-shaped coin to be issued as Australian legal tender. Its diameter measures 40.60 mm and it is 4 mm thick; Tom Vaughan served as the designer. According to the Perth Mint’s Web site, orders containing the Christmas 2015 1 oz. Silver Star Shaped Coin will begin shipping on October 19. For more information, please visit the item’s product page.